I have been lucky to have collaborated in the creation and touring of duo and ensemble shows with a number of wonderful artists… Take a peek at some of my past adventures below and get in touch if you would like to know more. Created in 2007, this hilarious acrobatic operatic duet has been performed intermittently around the world, when ever we happen to be in the same place… It is a true pleasure to have the chance to perform with one of the very best in the business. The Strong Lady is a feature act in this variety show that is touring to various German cities from 2015-2018, performing in some of the oldest theatres in Europe, with a cast of spectacular acts from around the world. Falling Up was a tender and warm acrobatic show exploring ideas of strength and femininity. I was the base to the 3 other strong women in the cast. Excitingly this project included research into injury prevention for outdoor circus performance. A comedy acrobatic ‘water-skiing’ show. This was my first professional touring work as a Strong Lady, it was with this show that I bounced into the world of street theatre, clowning and international touring. 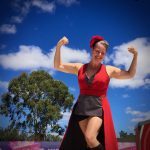 I have been lucky enough to find myself spruiking outside Australia’s finest sideshow tents and performing big shows on their tiny stages at festivals in Australia and the UK. I worked alongside the wonderful Tony Rooke as Production Coordinator for Circus Fest (the National Circus Festival of Australia) from 2000 until 2009. We produced a gathering of the circus community for a week of training, which would lead on to a weekend public festival. It was a remote site, without electricity or mains water and we would host a ‘zero waste’ festival for over 2000 people. The programing was done overlooking a lake and endless forests and we were working with the finest circus artists in the country. The logistics were epic but the festival was incredible.